If you are an entrepreneur looking to start your apparel line, and it includes different types of items, such as shirts, bags, pants, t-shirts, scarves, you might be a little bit overwhelmed with the many different branding options you will find. So we have prepared this little bit of a guide to the most common type of labels used by brand sold at the major retail stores. But let’s backup a little. There are certain labels your product must have BY LAW. And some others that you should have, for branding purposes only. The information you MUST HAVE BY LAW is related to Care & Content, such as what material was used and how to take care of your item so it will not get destroyed at the first or fifth wash. The information that you SHOULD HAVE relates to your Brand, such as name of your company or product line, where was it made and how can a customer find your product in the future. For your Branding labels, there are certain conventions that depend on the type of item and label placement. So let’s begin talking about Branding Labels for your product line. 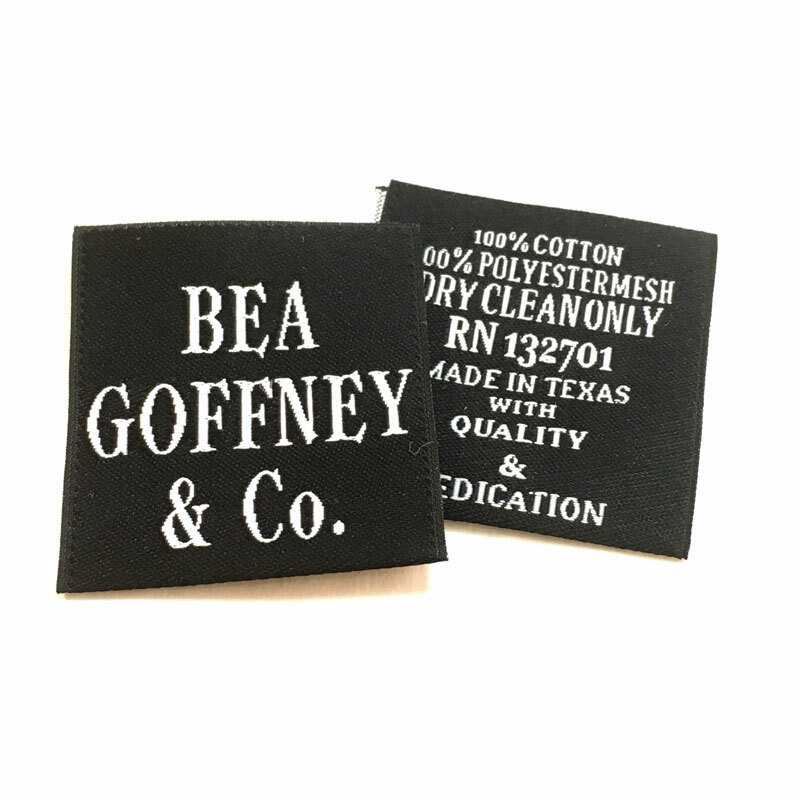 T-shirts, the label is placed on the inside of the neck, and it is usually a woven center fold (loop) label, sewn at the top on the inseam. The label can contain the name of the company or the product line, place of origin and composition. The greatest feature of loop labels is the ability to have combine a design on the front and a design or content at the back of the label, without compromising aesthetics or branding. Size is usually 1″ or 1.25″ wide and 3-4″ long, folded to a 1.5″-2.0″, with plenty of room to sew it on. 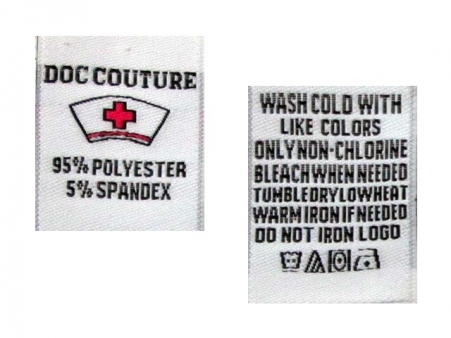 Shirts, Pants, Sweaters, the label is placed on the inside of the back of the item, and it usually a woven end-fold label, sew on the sides. Because these labels are usually 0.5-1″ wide and 2-3″ long with 2-1/4″ folds, making the visible label 1.5″-2.5″ in length. 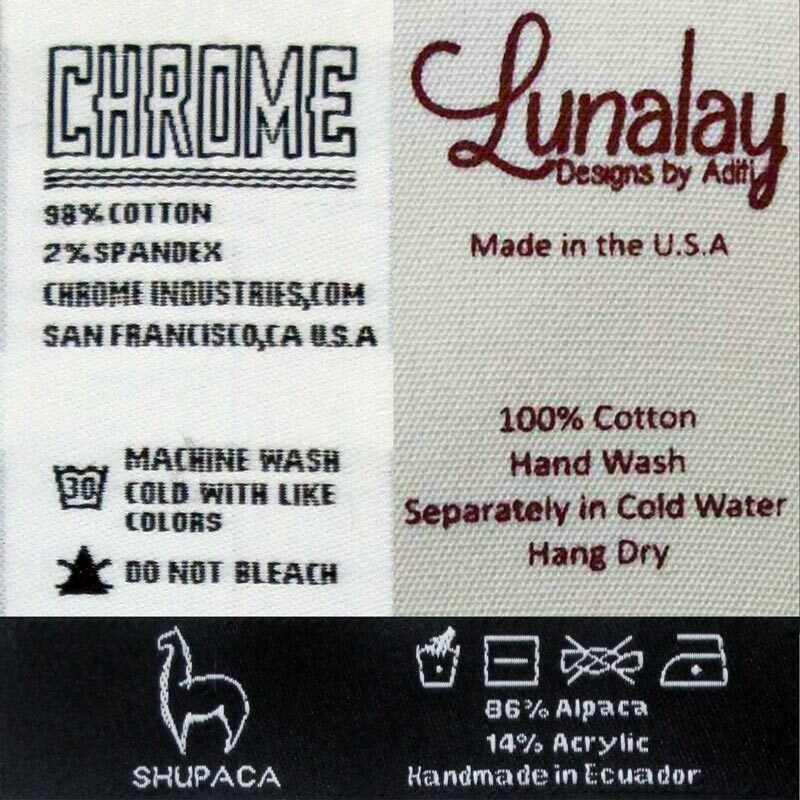 With such a limited space for design, these type of labels usually have only room for 1 or 2 lines at best, with the top line being the name of the company or product line in a larger, bolder font, that will make a good impact to the customer, and a second line with smaller font, with either the place of origin or size. These products usually have a second label sewn to the side or sometimes attached to this one. 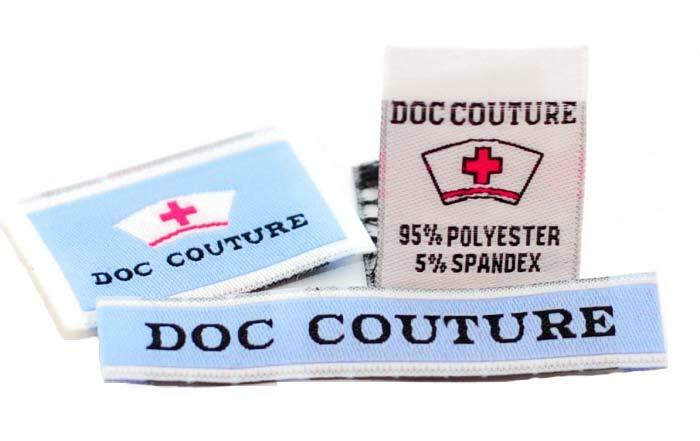 This second -commonly- satin printed label usually contains the content and care information, RN number. 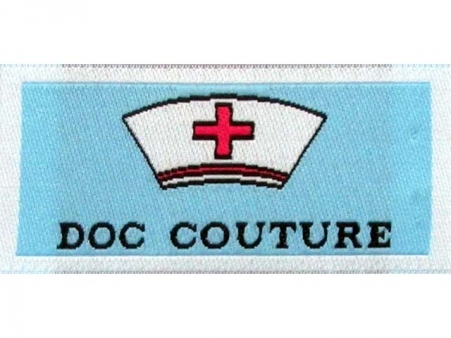 How “Doc Couture” is Using Their Labels? 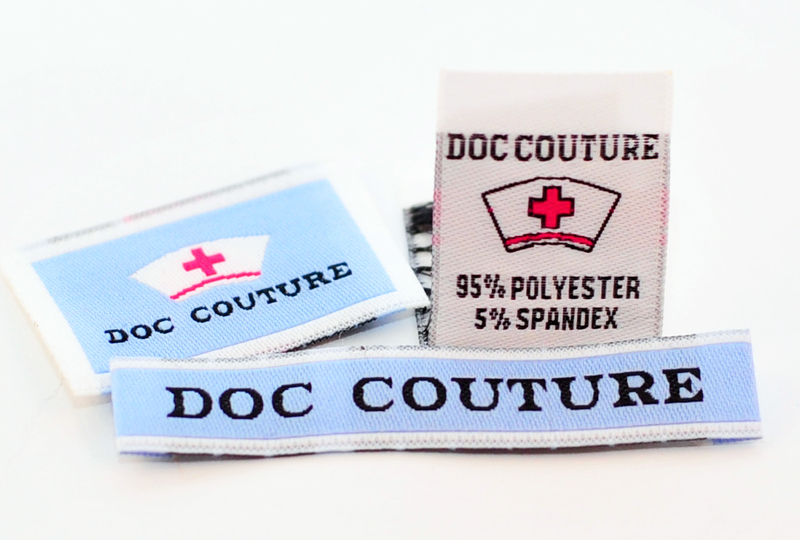 Woven Brand Damask Label. Straight Cut. Can be sewn all around, or sides only. Woven Care Labels. Front-Back Front – Logo + Content Back – Care Instructions. Sewn from the top. Why Care Labels Are So Important To Examine?